Two decades ago, President George H.W. Bush wondered why Hispanics were failing in school. He created the White House Initiative on Educational Excellence for Hispanic Americans and tasked it with studying the education gap and how to close it. Three presidencies later, the problem remains. Now, one in every five students in the public school system is Latino, but half drop out before receiving a high school diploma. And even fewer ever earn a bachelor’s degree or pursue education beyond the 12th grade. By 2050, the Census predicts that one in three people in the United States will be Latino. So if the country is going to compete globally, well-educated Latinos will have to be part of the equation. The time for action is now. That’s where Juan Sepúlveda comes in. Secretary of Education Arne Duncan appointed him director of the Initiative last May, and he’s changing the way the office works. Under Sepúlveda’s leadership, it’s transitioned from merely diagnosing the problem to helping solve it. He’s opened the conversation to teachers, parents, and students, allowing them to set the agenda, and decide what does and doesn’t work for Latinos. Between June and December of last year, the initiative hosted nearly 90 “community conversations” in 19 states, asking more than 6,000 people for their input. Their ideas will provide the framework for the Initiative’s work in the next few years. The conversations also served a second purpose: weaving a network of committed activists willing to work together to get results. Without a significant budget---it doesn’t have money to fund programs---the Initiative’s success is largely dependent on its ability to leverage change through influence and collaboration. That’s Sepúlveda’s specialty. Like President Obama, the Kansas native might be described as a “community organizer.” As a teen, he became the first high school student to work for the Kansas Secretary of State before going on to Harvard College and Stanford Law School. On the way, he became only the third Latino to claim the coveted Rhodes Scholarship. From 1992 to 1995, he worked for the Rockefeller Foundation, where he brought people together to discuss high school education reform in his adopted home of San Antonio, and then went on to found The Common Enterprise, an organization dedicated to helping nonprofit organizations, businesses, government agencies and other groups to address critical social issues. In November 2002, the Center for Public Policy Priorities awarded him the Hobby Visionary Award, which recognizes leaders committed to addressing the challenges faced by low- and middle-income Texans. 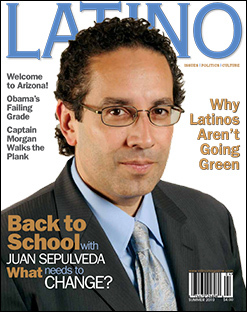 Sepúlveda’s job as director of the Initiative is to engage Latinos and those involved with educating them to improve academic achievement. And as Congress tackles reauthorization of the Elementary and Secondary Education Act, the largest piece of education reform since the No Child Left Behind Act, the timing is crucial. In our LATINO Interview, here’s what Sepúlveda had to say about the Initiative, the legislative agenda, and how to close the education gap for Latino children. What does the White House Initiative on Educational Excellence for Hispanic Americans seek to accomplish? Our mission at the Department of Education is work directly with the Latino community to really increase the number of Latino kids who are successfully getting through the education system. It’s a pretty straightforward goal, but a big one, a hard one, a tough one to take on. Across the board, we try to help the Administration think through all of the policies and programs that are potentially impacting our community. How does what you’re doing now compare with the Initiative’s work in the past? There’s no doubt that we’re building on the history and the background of what people have done, but the office started in 1990 and I don’t think there’s been a lot of success. Gathering knowledge about the impact of the growing Hispanic community on the education system has been a big part of what our office has done in the past, with blueprints, reports, and current statistics. Now we’re trying to move beyond that and focus as much as possible on action. The president has set a huge goal for us to once again be No. 1 in the world by 2020 with the highest percentage of our population having a piece of paper beyond high school. We know for that to happen, we’ve got to increase our numbers [in the Latino community.] So that’s a huge focus for us, a huge shift for the office to bring people together to focus on the issues that impact the community throughout the education system. What are some of the major challenges the Initative faces? One of the big challenges we face is just the idea of, “How do you go to scale?” How do you get people from across the country who are integrated in the Latino community, who are interested in education issues, together to do the work? How can the government come in and as a partner really work with the people who want to get things done? Probably the biggest obstacle we face is trying to turn this idea into reality, and that’s where we’ve been spending a lot of time. What was the idea behind your “community conversations” last year? We needed to get out of D.C. and we needed to really introduce ourselves to the Latino community, to the folks who are on the front line of dealing with the education community on a day-to-day basis. We said, “Lets do a conversation where we’re willing to allow folks who have their own interests and their own experiences with these issues to set the agenda.” It’s a way of doing business that we’re really excited about. It’s a really different way for the government to work with the community. This process let’s go … of trying to figure out ahead of time with the agenda should be. Trust people to come in with their own experiences and let them set the priorities. If you allow people to do that at the gathering, they’re going to take it to a whole another place. They’re taking care of issues that mean the most. It’s a really different way of setting the tone and allowing people to self organize and allowing people to really bring those issues that are most important to them. You have laptops set up on site, so when a group has finished their work, a volunteer takes a few notes. So at the end of the day you can print out the proceedings and get a real sense of what people were doing. Without a budget to fund programs, how do you affect change? The decision was made to not turn this office into a program office. So instead of saying, “Let’s take a program and house it within our office,” we know that the most powerful leverage we can do is by having career folk actually manage the programs. … We’re more of a broker and a convener, as opposed to a program office. So our job, for example, with the new Hispanic-serving institutions (HSI) grants, is not to run the program, but to step back and say, if the goal is to get more kids graduating from college, then how do we work with these HSIs to hold them more accountable in a way that doesn’t become a burden on them but holds them accountable for getting more kids into college and making sure they complete. That’s where we think our value is, as opposed to being a place that runs programs. I think that makes sense. [Our job] is to work with all of the different parts of the programs that are getting set up. We work closely with them to strengthen the programs and make sure they’re adding value. You want to be pushing policy. You want to be pushing new ideas and possibilities. I think that allows our office to be kind of entrepreneurial. What are some of the obstacles to Latinos’ educational success? The first big one is we don’t really have access to great early childhood education programs in our communities. Less than half of our kids are in early education programs. When they start out in kindergarten, they’re already behind. So the first challenge is access. How do we get more early childhood programs in our communities and get our kids the chance to participate? It’s also about quality. We’ve got to make sure that they’re not just glorified babysitters, that they’re not just throwing a video on in front of a bunch of kids and saying that’s early childhood education. When you start talking about K-12, a lot of different things are going on. One of them obviously is this big overarching issue of the graduation crisis. How do we get our kids through the K-12 program with so many kids who are dropping out or getting pushed out? There are a large set of interconnected pieces around the principals, who are the heads of the schools, around the families getting involved, around the standards that we set for our kids. A really important piece for us is moving around the idea that each state can really set its own standard. Under the No Child Left Behind Act, fifteen states lowered their standards. In the 21st century, for our kids to really be effective and really be prepared for the new jobs that are being created to compete in the global economy, they need a wide set of skills and knowledge. We need to make sure that we impose those standards. Forty-eight of 50 states are coming together to create those common standards because you don’t want Washington, DC telling people what to do. They’re raising those standards, changing the way we’re assessing our kids, making sure there are great teachers, making sure there are fantastic school leaders in front of our kids, making sure we go tailor the experience to the kids who are there. What role does language play? The issue of English-language learners is a very important piece for us as well. First, how do you deal with English-language learning students? While we have to take care of [these] students in very different ways, I think sometimes the larger community has this mistaken identity of us as a community. They think that most, if not all, of our kids are Spanish speakers, but roughly 7 out of 10 of them are speaking English. So the achievement gap issues are not about them learning English. The biggest bulk of students are English-speaking Latino kids that are having to close the achievement gap, but we still have to take care of those growing numbers of English-language learning students. We’ve got to tackle this issue of affordability. I was the first one to go to college in my family. There are so many who are the first generation to go to college that don’t understand how it works, don’t know about loans and grants and financial aid. We have to help people understand that the resources are there and that affordability shouldn’t be an issue for folks. We just had a huge increase in the amount of Pell Grants that we’re now going to be able to award to students. So there’s going to be a bigger chunk of money available to help our kids go to college. That was about $40 billion to increase Pell Grants. With those new challenges we’re talking about over the next decade, easily you’re going to be talking about 150,000 plus Latino kids who are going to be able to get Pell Grants, not loans, to be able to continue their higher education opportunities. The increase of the Pell Grants, the increase of the loans, the simplification of the financial aid form is making it easier. You don’t make the financial aid form so complicated that people who deserve and have a right to those resources don’t get them because…it’s too complicated. Adult education is a really important piece for us as well as in the community. There are 93 million Americans today who are adults and really need help on the education side. The larger group of that 93 million are Latinos. Once again, in tough economic times we need to make sure that our adults are not only doing the basic courses like GED or ESL. Those are important, but we’ve got to make sure that our adults are also taking the next level of courses, which they’re not right now, to give them more skills, and help them make a little bit more money for their families... . So each of those pieces---early childhood education, K-12, higher education and adult education---has its own challenges for the Latino community. Those are some of the ones that have popped up as priorities. What role does education reform play? It’s [also] about working with the teachers, who are doing an incredible job. If you’re doing better than average, the president believes you should be rewarded, you should be paid more because you’re getting our kids to go to the higher education levels in education. And for those who are really struggling, we know we have to work with them, we have to help them become better teachers. … If we can’t help them become stronger teachers, we have to say you’ve got to find another job, because it’s too important. Over the next four, five, six years, there’s going to be about a million new positions opening up as teachers retire across the system. So we know this is a great opportunity to create the next population of Latino teachers. While we make up 20 percent of the education system, only 7 percent of our teachers are Latino. So how do we get more of our kids who are the best and the brightest to sign up so that our kids are seeing role models in their classrooms? It’s not only Latinos who can teach Latino kids, but we know it’s an important thing to have those role models who are coming back to those communities. How do we address the high school dropout rate? The situations vary, but I think we know that in most places around the country about half of our kids are not getting through the system. So about half of our kids are graduating from high school, half of them are not. So that’s a huge issue for us in the community and a key piece of the K-12 agenda. We’re calling for a focus on turning around schools. There’s probably 95,000 schools that are at the K-12 level. Of the 95,000 schools at the elementary, middle and high school level in the country in the public school system, there are about 2,000 high schools that we know produce about 75 percent of the Latino dropouts in the country. They’re dropout factories. We call it a graduation crisis. But we know a lot of ways we can take this on because, unfortunately for our community, it’s a pretty concentrated set of schools. In each state, 5 percent of the schools are not getting it done. They’re considered to be the toughest, the schools that people have given up on. When we all come together, we can turn these schools around, and we have great examples of this happening already. We have good examples of turnaround schools who are changing the way they do business …working with our communities. We have pockets of excellence, schools that have figured it out right now. But it is the exception rather than the norm, and so the challenge for us is how do we take these great pockets of excellence and take it to scale. We think it’s fantastic and we’re encouraging more schools to do it, to really be creative and innovative about how you do school. Some of these schools that have changed, they’ve lengthened the school day, they’ve lengthened the school week, they’ve lengthened the school year. So instead of saying, let’s stay with the old system although it’s not working and we’re not catching up, they took a simple idea and did what the rest of the world is doing and saying they needed more time. They needed more time in school where it’s fun, it’s interactive, it’s engaging. Don’t just accept the old system. Mess with it, as long as you’re getting those great results for our kids. We know those things are happening, so we want to take those ideas and go to where are schools are struggling the most, where unfortunately a lot of our kids are, and turn those schools around. What did the Latino community lose with the death of Jaime Escalante? It was a huge loss, not just for the Latino community, but for the country as a whole. When I was at his funeral, there were so many teachers and past students who said how he changed there lives. When I talked to his students, they were very clear to me that it was hard…but the most important thing I heard from them was about an adult teacher who cared about them and really prepared them for life. One woman, who got her Ph.D. from Cornell, was talking about how she was going to work at a cash register at the store, which was a step up from what her folks were doing cleaning houses. Jaime said you need to go to a whole another level. And now she’s a bright math teacher. He really prepared them for college, for their careers, but also this bigger notion of preparing them to be in their communities and to be in life. That to me was probably the most powerful thing that I heard about the legacy of Jaime Escalante.